Primstar-2’s sculptie features are almost complete! We are planning an early adopters program that’s installable on the official blender-2.57 Release. Of course this only has a small subset of the full features of Primstar-2 but is certainly enough to consider migrating to Blender 2.5. We also have planned to support the creation, import and export of mixed builds, which may contain full textured regular prims and sculpted prims. The details about how mixed builds can be imported to Second Life (or other compatible environments) are not yet fixed. We are aiming to be ready to release the feature complete version against Blender 2.60 but please understand that we can not yet guarantee that. We are to some degree dependant on the Blender Foundation to implement required features in Blender and until those are done, not everything we have planned can be implemented. 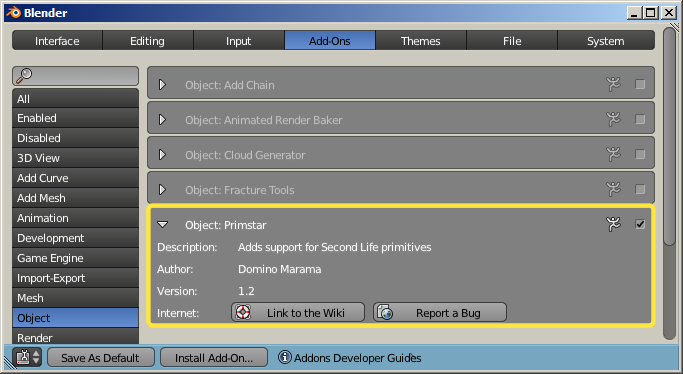 Shortly after the availability of Blender-2.57 we will offer access to the development version of Primstar-2. This development version is by no means feature complete and it will be given to you at your own risk and with minimal support. Nevertheless you may report problems and suggestions and we will be all ears. The development release will be available from the JASS-Shop in Second Life. You will get a permanent Link to the software. You will find all future updates of the development release under that link and the final release will be handed out as soon as it is available. Get all upcoming Primstar-2 related basic Jass-training tutorials for download in HDI quality. Buying now will directly support the development and documentation work! This offer will end one month before Primstar-2 will be officially released. I’ve asked more or less the same question to Gaia via an IM inworld in SL, but I’d like to expand with a little more detail. Your scripts look very interesting and especially the part about multi-sculpty import/export. The price is reasonable. Before I drop the L$$$$ however I have one show-stopper. My initial application is going to be ZBrush which I bought a couple months ago and have just been busting my brain trying to work with. There is the ability to create sculpty compatible prims (called ztools in zbrush) and work with a bunch of them on the zbrush canvas. Since the sculpting features and a whole lot more is totally awesome I don’t want to just drop it especially after spending so much real money. So what I want to be able to do is this: work on my sculpty linkset and then import it as-is into second life. Theoretically I can do this using sculptymaker (another tool elsewhere – though I haven’t got it to work yet) but what’s interesting to me is that jass/primstar 2 looks like it’s two way. i.e. you can both import AND export sculpty linksets into blender. Could I use your to push/pull sculpty linksets into blender and back to zbrush and vice versa (i.e. sculpty linkset from zbrush to blender to SL)??? is only available for the jass-products (and primstar-1). a big issue for you.